PLAY BALL.... Low seventies with only a little wind. Tim Hewitt had back surgery last Monday. He reports that he's doing well and hopes to be out to the fields before too much longer. Look who's on the National Senior Olympics postcard. It's our own Mike Z. PLEASE SCROLL DOWN TO SEE AN ARTICLE ON Quineth Roberts. Nicely researched and written by Bill Harris and Ray Kent. Want to keep track of your batting average? Use the links below. It is an on-line batting average calculator. Get an ID and then enter your data as the games progress. It has been tested on a few phones and desktops. Your results are completely anonymous. No one can see them (except me) and there are no words that could describe how little I care. Quineth Roberts was recently inducted into the Chattanooga Central High School Hall of Fame. For some of you that are new to our organization and might not know Quineth since he had not played recently due to health concerns, Quineth has had quite an athletic career. He was a pitcher on the 1955-56 state championship baseball team at Chattanooga Central. Also, in 1956, he was a pitcher on the American Legion Central Penneys Team for which he threw 2 no hitters. After high school, he attended Auburn University but was unable to compete as a Freshman due to the rules at that time that wouldn’t allow Freshmen to compete. In 1958, as a Sophomore, he helped lead Auburn to the SEC Championship. He pitched a 14-inning complete game against Alabama in the Championship Game, winning 4-3. He was first team all SEC and was the SEC Sophomore of the Year with a 7 win & 1 loss season. He led the SEC in wins, ERA (1.58) and strikeouts. He was unable to compete in the College World Series that year because Auburn went on probation for football recruiting violations. He was drafted by the Detroit Tigers and spent 6 years in the Tiger organization. During his 5 years in Spring Training he played alongside such Tiger legends as Willie Horton, Jim Northrup, Jake Woods, Gates Brown, and others. He also pitched in a Northern League All Star Game one year and his catcher was Joe Torre. 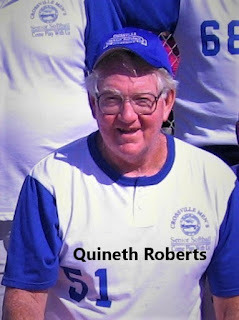 In 1993 Quineth Roberts was inducted into the Chattanooga Sports Hall of Fame. 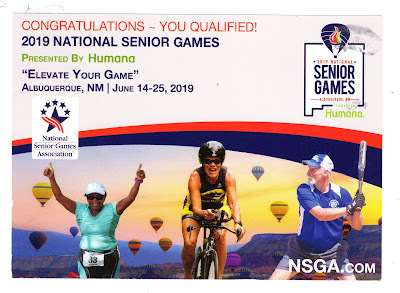 Quineth continues to be part of our organization since its inception and he was an integral part of our first two State Senior Olympics Championship Teams. In 2011 he was a member of our “Crossville 70+ Team” representing our organization in the National Senior Olympics at Houston TX. Quineth Roberts, someone you should know. Want to see the weather in downtown Crossville? Click the link below to see the webcam view. BTW: If you meet someone thinking about joining our group, point them to our website which has all kinds of info about playing.